There are times when you hope that Dr Who will show up in his Tardis to whisk you back to an earlier date. This happened recently when I was drinking an excellent pint of Atom Blend 1 Camomile in a pub in York. My destination, please Doctor, the Alexandra Hotel, Derby, 4th July 1974, for the first meeting of Derby CAMRA. None of those present then, including my much younger self, could ever have imagined camomile in beer. Like the additions of damson, elderflower, coriander and all the other exciting flavours we now take for granted, we would have thought it weird beyond belief. Back then, hops were Goldings or Fuggles. Nelson Sauvin, Riwaka, Amarillo were unheard of (types of grape, holiday destinations?). Beer was either mild or bitter (or, for the adventurous, you could have a mild and bitter, a "mixed"). In the first edition of Real Ale in and Around Derby, edited by Reg Newcombe and published in 1976, there were only 17 real ales available in Derby. These came from just eight breweries, none of them based in Derbyshire. So, I would have had a lot to report from the future: pubs with 17 different real ales on at any one time, over eight microbreweries in Derby alone, and a Beer Festival attracting 10,000 visits! They wouldn't have believed me. Just as well, we wouldn't be where we are now if real ale drinkers then had just sat back and hoped for better things to come. And we can't afford to rest on our laurels now in forty years' time we may find ourselves wanting Dr Who to take us back to 2014 - and leaving us there. 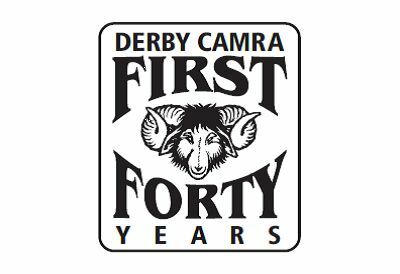 We're planning a special retro pub crawl in Derby on Saturday 18th October to celebrate 40 years of Derby CAMRA everyone welcome including non-members, keep checking the website.